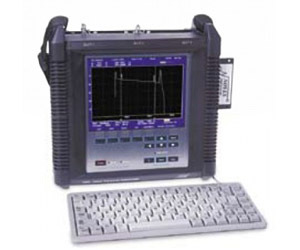 The M600 is a full-featured mini-OTDR designed to accept both multimode (850/1300nm) and single-mode (1310/1550nm) modules for testing flexibility. Modules are user installable. All M600 models include: a 7.7-inch color LCD display, CompactFlash™ drive and memory card capable of storing up to 1,500 traces, 3.5-inch floppy disk drive, full-sized keyboard, and soft carry case. Pulse width and range can be set automatically for maximum ease-ofuse, or manually for maximum flexibility. The M600 OTDR may be equipped with a Visible Fault Identifier (VFI) module. The VFI module is a 650 nm visible red laser source designed to fault-locate and trace optic cables.